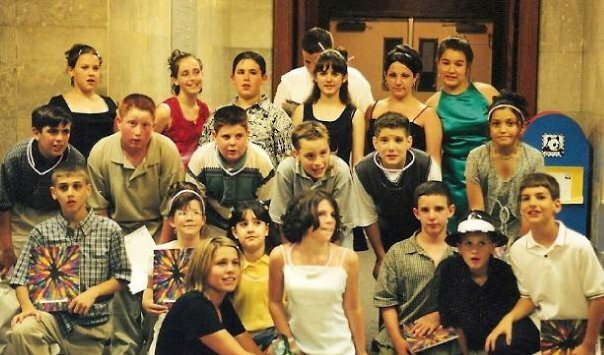 This photo is from my sixth grade dance in 1999. I think it is interesting for a few reasons. It’s always fun to look back and see what you THOUGHT was fashionable compared to what you think is fashionable now. I also think it is unique that this photo was taken at the close of a very interesting fashion decade. I remember buying these sparkly purple hair chopsticks because I had seen them in the film Clueless. My dress cost $5 from the sale rack because there was a hole at the hem, but my mom sewed little butterflies on the edges to hide it. It fit me perfectly and was my favorite dress for a long time. And my best friend (to my right) wore a classic 1990s slip dress – I think it may have even been Calvin Klein!